Imbolc or Imbolg (pronouced I-molg), is one of the major sabbats, one of the Eight turnings of the wheel of the year marking the mid point between winter and spring and was widely viewed by the Gaelic tradition as the end of winter. Celebrated throughout Ireland, Scotland and The Isle of Man, Imbolc later became known by Christians as Saint Brigid’s Day or the Feast of Brigid. Originally a Pagan tradition, peasants would carry torches across fields in honor of the Goddess Brigid and ask for her blessing of purification and fertility. The torches, later replaced by blessed white candles, would line the hearths and windows of all the homes. Being the end of winter, the beautiful light of the many candles brought peace and serenity to the community hoping to shake off the last bitter clutches of winter. Imbolg is one of the four Gaelic Celtic season festivals as well as Beltane, Lughnasa and Samhain, and therefore, great feasts were held on this day. In honor and asking for the Goddess’s blessings, Brigid’s Crosses and Brigid dolls called Brídeóg were made and taken from home to home in a processional parade. Many offerings were made to Brigid in hopes she would visit the home and bring her blessings. Altars were adorned with fruits, grains, seeds, bread, mead and milk. Beds were made for her to sleep in, ornamented with dried flowers and sweet treats. One would see clothing hanging on every house, in the hopes for Brigid’s blessings in daily life, in the actual fabric of our lives. The triple Goddess Brigid, mostly noted as the Goddess of purification and fertility, was a many faceted deity who could teach the ways of archery, poetry, black smithing, herbal medicines and cures. She was the Goddess of fire, midwifery, inspiration, protection, healing and craftsmanship. Brigid was invoked to protect livestock and especially to perform divination. All forms of Gaelic divination were practiced in honor of Brigid and especially during Imbolg. Imbolg’s symbolic tree is the ash and the herbs and incense associated with this Sabbat include Heather, Chamomile, Ashe wood or leaves, Lemon, Honey, Rose hips, Coriander, Myrrh, Vervain, Violets, Hazel, Benzoin, Dragon’s Blood, Mastic, corn, grains, Storax, Balsam and Witch Hazel, all of which can be used as offerings to the Sacred Goddess. The Oils attributed to Imbolg are Vanilla, Carnation, and Vanilla Musk. The colors typically used are white, for purification, and red for the coming God/Spring. People would often burn the Yule log at this time and make a bed for Brigid using the corn or wheat dolls made during the last Lughnasa. Witches would perform dedication rites and ceremonies at Imbolg and sacred spaces were dedicated or rededicated to Brigid. Celebrants would also make a Brigid’s cross for each room in the house and burn the old crosses on the Imbolg fires. This was also the time in which candles were made for the coming year. Candles of all colors and purposes would be blessed, smyted and put away for later use. 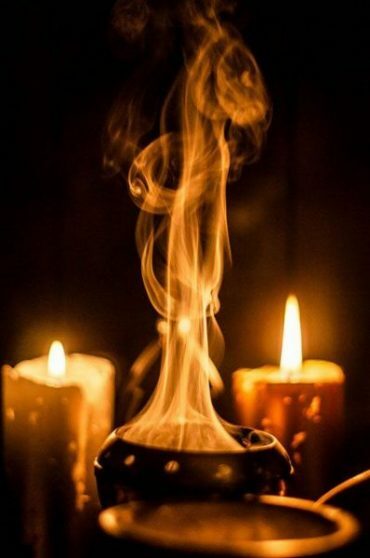 The process of smyting a candle is to charge the candle with a specific intent and burn the candle briefly while visualizing the intention being charged into the candle. Then the candle would be snuffed out with the fingers and stored for later use. Considered one of the oldest Gaelic celebrations, Imbolg is believed to date back to the Neolithic period based upon the alignment of megalithic monuments. Many wells call Brigid’s Wells dot the landscape of Ireland and Scotland and are considered holy or magical places. Churches, honoring the significance of these ancient places, have been built next to these wells and incorporate their use as a blessing site. The water of these wells are considered sacred and believed to bring blessings and purification. To this day, travelers, pagans and christians all over the world visit these holy wells to gain Brigid’s favor. Celebrated throughout England as well these days. I was just re-reading this and realized immediately that I left out England. It is a major Sabbat, one of the four fire festivals! Wow , vey nice and educational !